Cladophora is a filamentous, green algae that grows in all five Laurentian Great Lakes. Although native, clear water created by zebra mussels and high levels of phosphorous have allowed it to become overgrown and cause local environmental problems. As the algae sloughs off and is carried to shore, there have been outbreaks of avian botulism as well as reports of beach fouling. Because of it's harmful effects, determining the extent of Cladophora is useful for water quality managers as well as utility operators and recreational beach-goers. 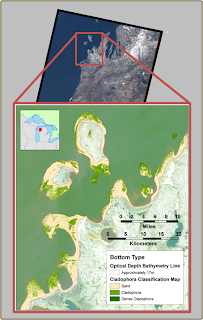 In 2011, Michigan Tech Research Institute developed a technique to use satellite imagery to track the extent of Cladophora. Using an algorithm based on the the work of Lyzenga (Lyzenga 1978, 1981, Lyzenga et al. 2006), they depth-corrected Landsat data to map Cladophora at a test site - Sleeping Bear Dunes National Lakeshore - and achieved 85% accuracy (see right). You can view a *.pdf of the test site results or read more about the process they used here. 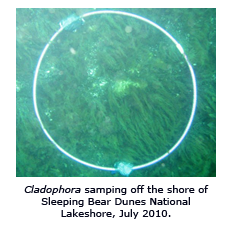 The algorithm was subsequently applied to the coast of Lake Michigan and charted the location of Cladophora to a depth of ~20 meters. An interactive map of the result can be seen here.